So here we are, two awesome, gladness-bringing cover images to titillate and tempt you. 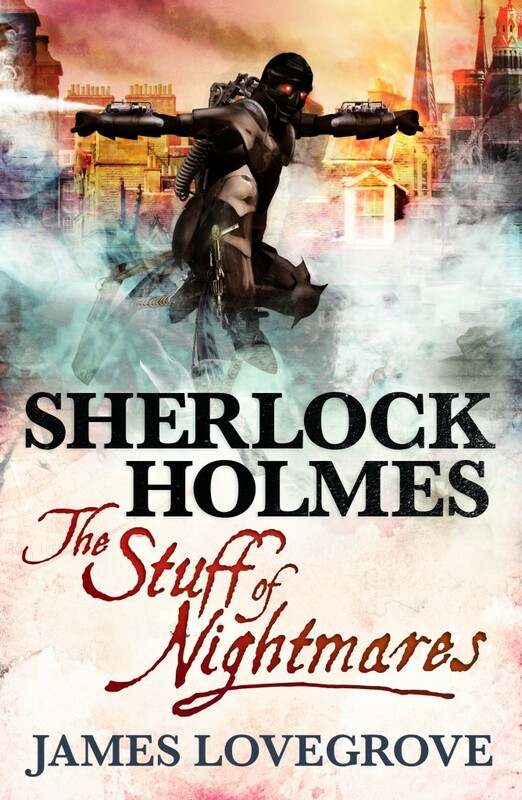 First, Sherlock Holmes: The Stuff Of Nightmares, courtesy of Titan Books’s in-house designer Julia Lloyd. 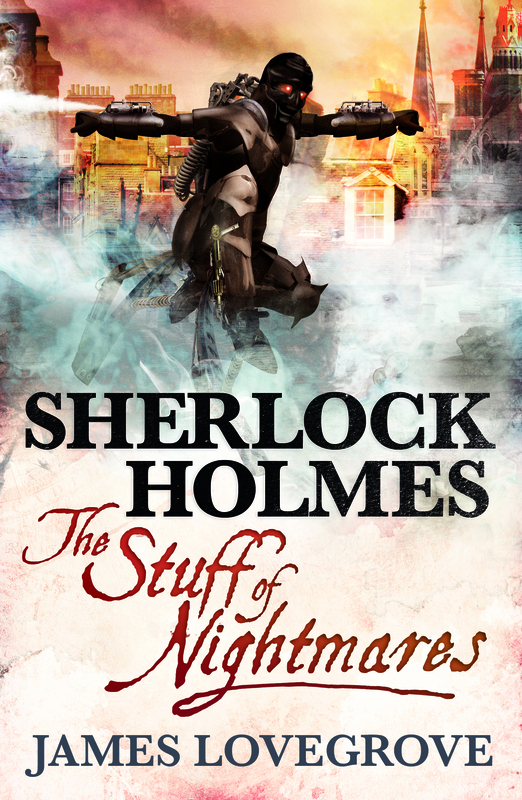 The novel is out now, and you owe it to yourself, as a patriotic Holmesian or as a Holmes-loving foreigner, to buy a copy. 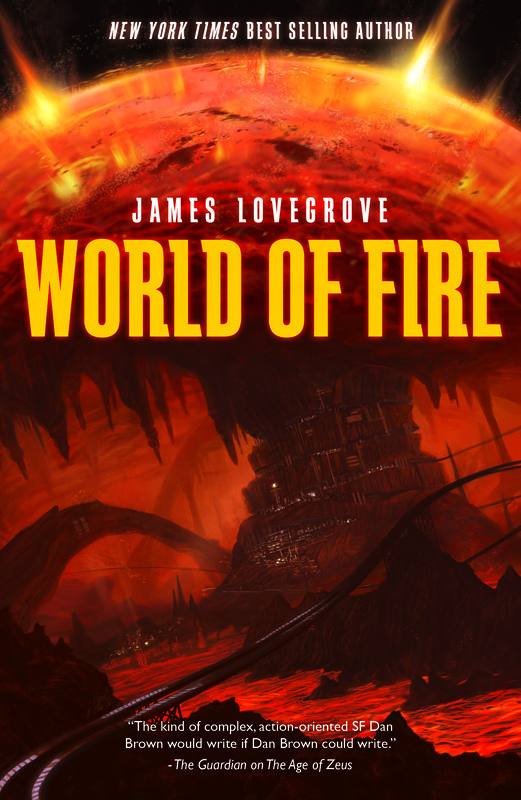 Then there’s this here one for World Of Fire, courtesy of Jake Murray. 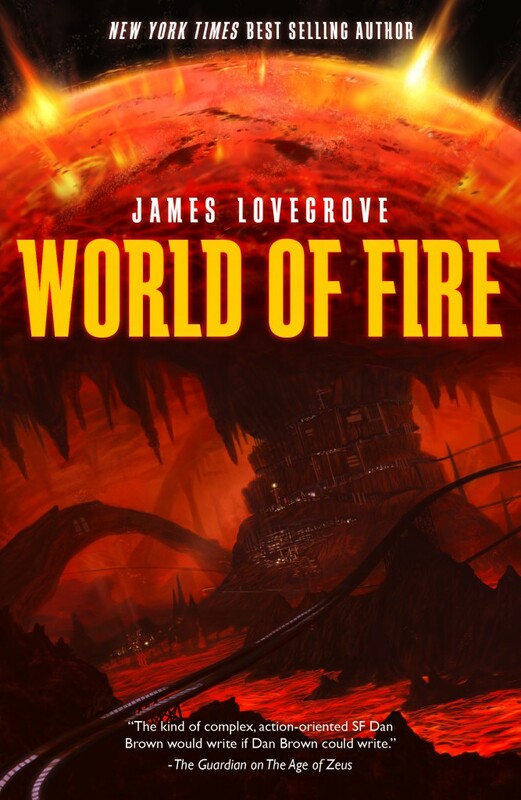 I’m not at liberty to say much more about the book itself, mainly because I haven’t written it yet but also because it’s kind of a hush-hush project. What I can tell you is that it’ll be published in autumn 2014. By the way how’s everything going on with the Age of Shiva buisness? I love it! Great fun. Thank you. You managed to sneak Konnie Huq in there, which was a surprise. I’ve never thought of her as an actress, but you never know. It could be the next logical career move. Shiva is under way. In fact I’ve got about 90,000 words done, so I’m in the home straight, although I have no idea how it’s going to end. There are various ways it could go, all equally viable, but I’ll just have to see which denouement feels right when I get there. Here’s the weird thing about my choice of Konnie Huq as being Zaina Mahmoud erm see…as you know, readers imagine what the characters look like by comparing them to actors, for instance your choice for Rick Ramsay as Samuel L Jackson, so when reading Zaina…my brain for some reason instantly thought of Konnie Huq, possibly due to watching Blue Peter when I was younger…strange I know. I’ve also chose Todd Lasance as an ideal Xander Landesman because of Todd’s acting work as Julius Caesar in ‘Spartacus: War of the Damned’. It is difficult on thinking of how the story based of ancient epic hindu mythology, hell I’ve been trying to research it for over 3 years and yet I’m only half way through of understanding it, its not as easy as understanding greek mythology at all, Hindu mythology from what I’ve gathered is never straight-forwarded, one meaning has another meaning in a different matter, twists and turns of events and even the hindu god pantheon is hard to get your head around. Anyway, from what I read in a library about hindu mythology, normally at the end of Kali Yuga, where the tenth final avatar of Vishnu, Kalki, slays the demon Kali and bring about Satya Yuga, which the hindus believe as being ‘the golden age’. The Hindu mythology is so huge and extensive I can’t really hope to include all of it, or much of it, let alone understand it, which I’m told is the work of a lifetime; but I’ve extracted the bits I like, the stuff that’s necessary to the story I want to tell, the juice, and done my best with that. I don’t want to disrespect the beliefs of a billion Hindus, but the novel is really just one person’s interpretation of what’s available, given a superheroic pop-culture action-thriller spin. I am using the Kali Yuga, definitely, because a little apocalyptic-ness (???) never hurt anyone. Do you think the tenth Avatar is called Kalki or Kalkin? There seem to be as many sources that claim the former as claim the latter. I’ve gone for Kalkin mostly because the name is then less easy to confuse with Kali (who is also in the book). Anyway now that I’ve got those two questions out of the way, I need to tell you something that is actually important about both the story and sensibility of people who’re Hindu themselves or otherwise. Now, I understand that you are planning on using the Ten Avatars as a superhero team in your book, which I know is a great and unique idea for a story, but there’s a problem that you must avoid of making. I know in my research that in the ten avatars, it states that the ninth avatar is Gautama Buddha/The Buddha in some Hinduism religion of lore, but as a loyal reader of your books and a lover of mythology, I must implore you to not use the Buddha as an avatar in the story. I only ask you this because I want you to avoid any negative reactions from readers from either Hinduism or Buddhism origin, as there has been major disputes between the two about the claim of Buddha being an avatar or not and other various things were written about him, this was very unpleasant to the neighbouring countries. I know that this might be a wrench thrown into the works but it’s just that I don’t want you to get any incredibly bad reactions from religious people, especially after what you said earlier saying that you don’t want to ‘Disrespect the beliefs of a billion Hindus’ as well as Buddhists as well. I just don’t want you to be viciously discriminated like as how Salman Rushdie was with his book of ‘The Satanic Verses’. Mohini – She is, according to both religion and mythology, the only female avatar of Vishnu. Mohini is portrayed as a being a ‘femme fatale’, an enchantress who maddens lovers, as well as sometimes leading them to their doom. It was told that she retrieved back the pot of Amrita (an elixir of immortality) from stealing Asuras (demons), then she gives it back to the Devas (gods), helping them retain their immortality. There are other stories telling about her as being a master assassin (Assassin’s Creed?) as well as being the slayer of demons too. In my point of view, Mohini could well be the ‘strong, seductive and deadly’ female character of the avatar team. Balarama – He is in fact the elder brother of the 8th avatar Krishna. Now before you ask, I know it may sound strange as to why there are two avatars in Hindu mythology, but there are two plausible reasons. Firstly, the confusion of about the topic of buddha/balarama is confusing for too long. The confusion starts with a ‘dasavathara stotra’ which lists buddha as the 9 the avatar. But the Buddhists don’t accept Buddha as 9th avatar and his teaching differ. In the ‘Bhagavata Purana’, it claims that both Krishna & Balarama came to Earth as avatars to establish/restore ‘Dharma’ (which means ‘upholds, supports or maintains the regulatory order of the universe’). There have been other claims saying that Balarama is actually an incarnation of Adishesha/Shesha, the Naga King, who which allows Vishnu to rest on him like a bed. I hope that you’re not mad or annoyed of me making this comment, as I only wrote this to tell you to be careful, as I feared about possible negative reactions of using the Buddha as an avatar. Please continue your excellent hard work into making this book into one of the best written works of all time! I think WordPress must not have liked those links, Tim. It sent your first post to the spam bin, but the second came through fine. I appreciate your concern about Buddha. He is in the story, however, and sympathetically portrayed. He’s the Peacemaker, whose words can soothe even the most belligerent hearts. That plot you found on Amazon is absolutely right. I’m making a super-team out of the Ten Avatars, and you’ll see when you read the book that they’re not actual incarnations of gods but something different and, I hope, subtler. I’ve managed not to offend any vodou practitioners so far with Age Of Voodoo, and I feel I can do the same with Shiva. The “Wolverine” of the team is, in fact, Narasimha the Man-lion. Parashurama is the leader and tactitian, Rama the laconic cool dude, Vamana (the Dwarf) the one with the attitude. Kalkin is pretty kickass and gets his moment in the sun near the end. I wish I’d thought of that motorbike idea, though. It’s too late to work it into the text now, but it would have been cool. You will, though, find that the Garuda bird and the sea-monster Makara both get roles. It’s all about reimagining the themes and mythology of the Vedic texts and putting them into a science fiction context. I don’t think anyone will take offence because I’m clearly approaching the material in a spirit of respect while having some fun at the same time. And yes, Mount Meru is their base of operations, their Hall of Justice, Fortress of Solitude, Tracy Island, whatever. I appreciate your concerns nonetheless, and have no problem with you voicing them. Age Of Shiva is about the archetypes of the Hindu characters and how they’re presented to the world. There are layers to it that will become apparent on reading, and you’ll see why I’ve done what I’ve done.